Wash day this weekend took two days instead of one. It’s been ages since I did an Aphogee 2 step and my last henna gloss just over 9 weeks ago. They both work as well as each other but again henna won out over Aphogee as my strengthener of choice. Last weekend I noticed a bit more breakage than is normal for me so I had already resolved to fix it this week. I know that I should not be waiting for a problem to occur before fixing it, I should anticipate things beforehand (naughty Alma). Since I should be doing a strengthening treatment every 7-8 weeks, I’ve put a reminder in my Google calendar now so that I don’t forget again. Yes organization is my middle name. I have one really annoying gray hair that grows right where my part is and somehow it didn’t get blended in during my last henna so this weekend I went with full strength henna just to be sure that it went away. Of course I added a few embellishments to ensure that my hair would not be dry afterwards. Enough water to make a very thick paste. My henna paste is always pretty thick (somewhere between a cake batter and a full on dough). This makes it easier to apply without dripping bits all over my bathroom floor and it also means that I don’t get drippies all over my neck for hours which is very messy. I braided my hair into 8 large braids and washed thoroughly with a clarifying shampoo. I then applied the henna to my hair without taking the braids down, massaging it into the braids to make sure that it was in contact will all the strands. I meant to leave in in overnight and rinse in the morning but life got in the way and before I knew it 22 hours had gone by! No harm done, the oil in the henna mix ensured that my hair remained supple yet strong. I rinsed, then took down each braid one at a time shampooing with my sulfate free poo make sure that all the henna was gone. I then co-washed with Tresemme naturals conditioner and rinsed (Yaay the gray way gone!). Again styling this week was a blow dry and flat iron. I had very little breakage during the styling, what you can see in the picture was shedding which is about average for me. I am currently addicted to how smooth my hair feels when straight. The moisture retention is brilliant (compared to curly days). Which brings me to the major change that I am making to my regimen. Now as you pick up your jaw off the floor I would just like to acknowledge that I am well aware that I have been the ‘once a week’ queen since the beginning of my hair journey. In the last 4.5 years I have skipped my Saturday/Sunday wash day just a handful of times and have usually made up for it with an extra long DCing session when I finally got round to washing. I still vehemently believe that in the beginning of your journey when you know next to nothing about hair care, or your own hair for that matter, washing more often is the way to go. I am not about to advise a noob who’s been washing her hair once a month for years to continue doing so. 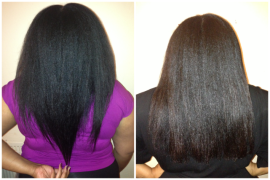 You need to get to know your hair and the only way that you can do that is by handling it on a weekly basis. But I know my hair very well by now and I keep an eye on its progress every day so I would be able to tell if something was out of whack. I have also seen many other ladies (youtube) who have had success with washing their hair less often. I am also well aware of the fact that washing is not where your hair length is determined, it’s the degree of manipulation. Why the change now? I hear you ask. Well, constant wet braid outs do a serious number on my ends with ssks and thinning so I am staying away from them for the time being. I would honestly wash my hair daily if it could be done without manipulation (when wearing a weave it can!). But my hair requires way more manipulation than I would like in order to get it straight and yes, I plan to wear it straight for a few months. The moisture retention is really good when my hair is straight so I really want to be able to take the style to it’s limit and use it essentially as a protective style. There are of course a few rules that I have made for myself while this change of reggie is in effect. 2. Wear my hair down just one day a week. This makes perfect sense since I will not be combing my hair. I will stick with ponies, a single braid or buns. 3. Moisturize and seal every day. When my hair is straight, daily moisturizing is not strictly necessary even though I do it anyway! The main one for me is an itchy scalp. I used to suffer from dry itchy scalp in the past when I washed my hair less often. My pores absolutely hate to clogged either with oil or my own natural sebum. For this reason I plan to do scalp massages every evening as I moisturizing. Basically to try and dislodge sebum and move it where it’s needed, my hair. I don’t know if this will work but that’s the plan anyway. The other main issue that I am anticipating is dandruff. Dandruff is dead skin cells and everyone’s skin sheds daily. When you don’t wash your hair regularly, the dandruff has no place to go so it remains as white flakes stuck in your hair. Gross I know. I don’t really have a battle plan for the dandruff because I know only water will fix the problem. With any luck, I may not get any but, I suppose this remains to be seen. All in all even though this is a risky tactic to reduce manipulation, I think it worth a wager and I will try to stick with it for 6 months then assess my progress then. Having said that, I am a woman and as always it’s my prerogative to change my mind! Hi, I’m fairly new to my natural hair care regimen. I think I’m on the right track but am trying not to turn into a product junkie so I keep it pretty simple. I’m concerned about whether or not I’m using enough protein on my fine coily strands. Currently I use s curl spray, coconut oil and cantu shea butter strengthener and/ or leave in conditioner to moisturize. I use apogee hard protein every 6-8 weeks especially if I’m going to weave or wear twists/ braids. I also do molasses pre poos and deep conditioning under the dryer after wash. Should I be using an additional protein conditioner in between aphogee treatments to insure length retention? hi alma i have decided to go back to flat ironing my hair regularly and wearing it straight all the time because after 2 yrs experimenting with curly i feel that the tangly ness is not for me lol i had much greater success with straight hair in all areas except where my crown was concerned, but i never had issues with dry ends, tangly hair, breakage/splitting or any of the usual maladies associated with altered hair (in a lotta ppl’s minds). the only thing is this time i have resolved to not wash my hair wkly, as i’d done before and which i think contributed to my issues with length retention in the crown (the manipulation from the detangling being the culprit), and like you, i had adopted the practice of reserving detangling for wash days and totally PSing (french braid only) b/t washes. it was peaceful, predictable and it worked, ironically, despite the relatively frequent heat usage. this time, i want to stretch my washes out, but since going to a curly regimen and upping my washing to 2-3 xs wkly, the problem i anticipate and fear is that i will suffer horribly from itchy scalp. i think this would be psychological, of course, because i seem to recall from childhood that i would go about 2 wks b/t washes, and i noticed that whenever i consistently washed my hair on a set schedule my scalp would come to “expect” that it should be washed on whatever day post, and itch accordingly lol kinda like it knows what’s going on and is mad at me for not going with the program. but ideally i’d love to only wash my hair once per 3-4 wks, so that i wouldn’t feel pressed to straighten it more frequently, or detangle it more frequently, kinda like Sista with Real Hair, and a few MBL-WL heat-trained naturals i’ve known IRL. i’m always astonished at how long they can go without washing, and it not affect them at all, and i truly do think there’s a very strong mental component involved. so what suggestions would you have for training one’s scalp to go the distance, and get to a place where 3-4 wks would seem natural? i know it’s healthiest to wash more frequently but i’m far more interested in preserving the press for as long as possible, as i doubt that itchy scalp would in any way hinder hair growth. what do you suggest/think? thanks! Ah I know exactly what you mean hun. I had resolved to become a straight hair natural at the beginning of this year before the itchies made me backtrack, lol! Actually it’s not a psychological reason at all why your scalp is itchy, it’s just a sebum issue. Basically, your body, or scalp in this case, produces sebum according to requirements. So if you wash more often, the glands get more active and produce sebum more often and on the other hand if you wash less often, sebum production reduces. My best advise to you, although it won’t be pleasant is to do nothing. Just grin and bear it. If you try those tricks of ‘dry cleaning’ like dry shampoos or wiping your scalp with witchhazel or whatever then your sebum production will continue at the increased rate. The only way the sebum will reduce naturally is when it senses over time that there is a surplus so it will reduce production according to your new schedule. It’s also the same reason why some ppl suffer from dry scalp when they start washing more often. Sebum production hasn’t caught up yet! You are not the only one, I got my sister into weekly washes a few months back but recently when she started the protective styling challenge, she was having trouble with the new washing every 2-3 weeks regimen. She’s now getting a bit itchy towards the end of the 3 weeks but to begin with she was going crazy at the end of a week! wow thanks so much for the advice! it’s great to hear from someone who’s been down this road before. i think i’ll def give it a try and see how it works out. so far i’m on day two of not washing lol only like…30 more to go! lol i’ll def pop in to let you guys know how it works out, even though i’m sure i’ll wanna cave by the end of the week.